As a dietary supplement, take (up to 2 scoops as needed for maximum effect) do not exceed 4 scoops per day. Jan 08, 2018 Primeval Labs Intracell 7 Now with EAAs! The Most Advanced Intra Workout Ever Created! And then our pineapple mango flavor! 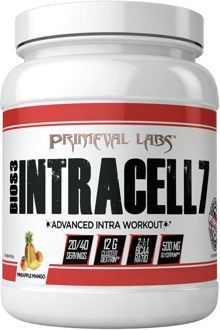 Intracell 7 is the ultimate key to crushing through your workouts and reaching your goals. This innovative formula developed by Jerry Ward delivers proper intra-workout nutrition to enhance your performance and reduce fatigue. Intracell 7 provides maximum energy to fuel your workout and ramp up protein synthesis so you can achieve a whole new level in strength. Highly Branched Cyclic Dextrin: Carbs! Every athlete recognizes the importance of carbohydrates in performance, strength and growth. However, we also know that not all carbohydrates are equal. It passes quickly through the bloodstream to load directly into the muscle. The shape also allows it to pull other nutrients from the blood into the muscle along with it. In addition, because it passes through the stomach quicker than other carbs it does not cause issues such as bloating and cramping. L Taurine: This amino acid helps the body regulate energy levels, stimulate muscle contractions and metabolize fat. Some studies have shown that when used during exercise, taurine supplementation can improve performance and increase fat oxidation by as much as 16%. As you go through a workout the muscle is depleted of taurine and thus strength begins to decrease. Supplementing with taurine during your gym session can help you maintain strength to the end. Glycerol Monostearate: This naturally occurring supplement improves hydration and aids in the absorption of other nutrients. Old school body builders used to use glycerol as a diuretic. It pulls excess water within the body directly into the muscle cells. Not only will it help keep you hydrated and delay exhaustion during your workout but this ingredient also ensures higher absorption of the other nutrients that make up Intracell 7. These three nutrients are classified as essential branched chain amino acids because the body cannot produce them; they must be obtained from food or supplementation. These BCAAs all work in conjunction with each other to aid in protein synthesis and muscle recovery. L-Valine is essential for energy conversion and from that, the L-Leucine plays a vital role in the generation of muscle tissue. L-Isoleucine can increase glucose tolerance and improve insulin health. This amino triad helps promote fat metabolism while at the same time preventing muscle catabolism, or breakdown, to aid an athlete in achieving a lean physique. They are an integral part of Intracell 7 due to their significant role in muscle hypertrophy to increase strength and mass. Moreover, when ingested with the fast absorbing carbs,these BCAAs reach the muscle rapidly to begin the process of protein synthesis. Nitrosigine: This patented compound is an arginine-silicate bond designed to boost nitric oxide levels. Nitric oxide is a key component in workout supplementation as it increases blood flow to the muscles by relaxing the smooth tissue of the blood vessels. Silicon strengthens and enhances the flexibility of arterial walls but is very difficult for the body to digest. However, when bonded to the arginine the absorption rate is far more significant. Within just 30 minutes of dosing, Nitrosigine boosts the blood arginine levels and they remain high for up to 3 hours. Continued use can even help nitric oxide level build over time to produce better pumps with every workout. All these ingredients in Intracell 7 work synergistically to give you the ultimate in workout supplementation. The fast acting HBCD carbs absorb quickly to fuel your muscles. This super carb rushes to the muscle dragging with it the blend of aminos to boost energy conversion and kick start protein synthesis. The glycerol hydrates the muscle cells to allow these nutrients to work at peak level. And the Nitrosigine increases blood flow and the delivery of all these nutrients throughout the entirety of your workout. 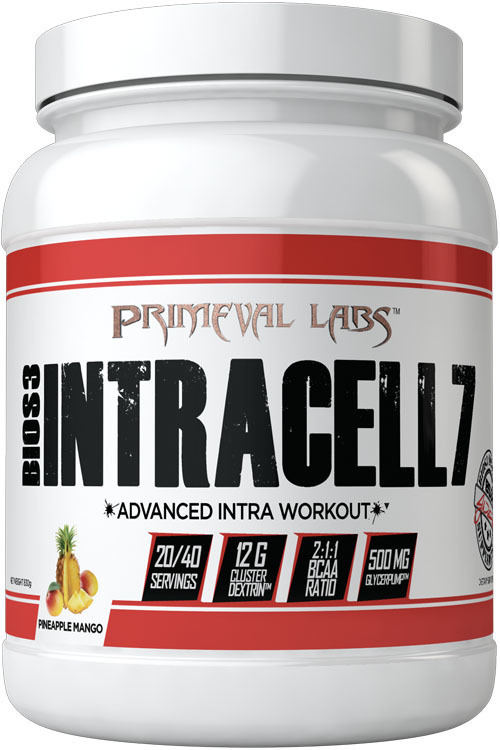 Enhanced performance, reduced fatigue and a unique blend of nutrients to promote protein synthesis for strength and growth - Utilize Intracell 7 before and/or during your workouts and experience the difference!